In the lobby of the Toyota Commemorative Museum stands a circular loom, a dynamic exhibit that symbolizes the museum’s core philosophy. After successfully managing to automate the weaving process, Sakichi Toyoda set himself a further goal, that of developing a machine that could weave extremely broad pieces of cloth, quietly and with minimum energy. The result was this circular loom, invented in 1906. Running in an optimal circular motion, it proved to be a landmark development in cloth weaving, and the machine acclaimed as a “dream loom” was patented in 19 countries. 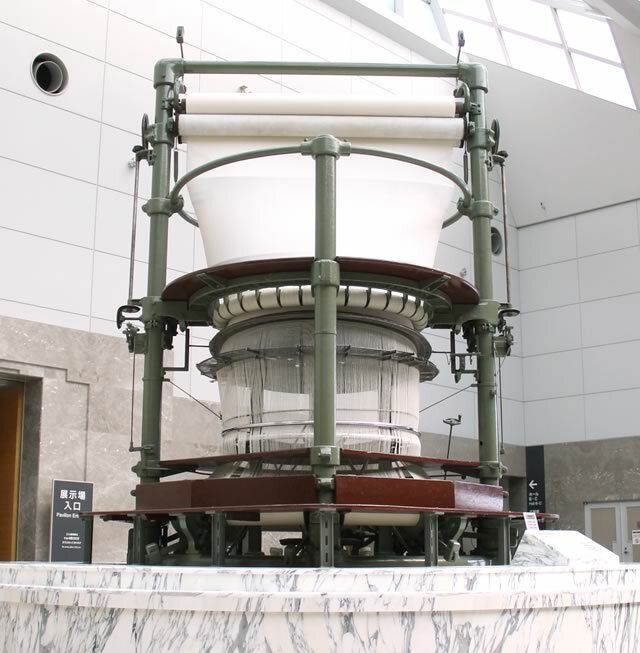 In an era when many were slavishly imitating America and Europe, Sakichi Toyoda demonstrated the possibilities of home-grown Japanese engineering and science. The machine on display here was made in 1924 and is the only remaining complete machine that underwent extensive testing. In March 23rd, 2005, Japan Post issued a stamp featuring the circular loom. 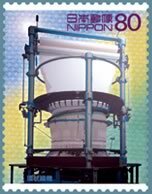 As an outstanding landmark invention in the modernization of Japanese science and technology, the loom was the perfect choice for this series of stamps. The stamp was the seventh issue in the Science and Technology and Animation hero and heroine series.